Hiding in My Craft Room: HIMCR #37 - Super Scraps Saturday! 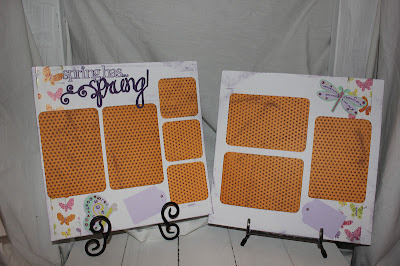 The challenge this week, the 2nd week of the month, is SUPER SCRAPS SATURDAY! So dig out those scraps and create any paper project. You have until Friday, March 16th to link up your creation for this challenge and to get entered into the monthly drawing (still not pictured and posted, so sorry!). When uploading to online galleries please use code HIMCR37. I must admit here, that sometimes using scraps can be a real challenge for me! I'm not completely satisfied with this card but it's about using those pieces of paper, cardstock, cut images, ribbon, etc. that are just being stored in a bin. And that part I'm happy with! These pieces cut from Elegant Edges cartridge were all in my scrap bin. I have no idea the size! I put them together and it fit a sentiment perfectly I really wanted to use and then I proceeded to force it to work for a card. That was my first problem!! Card front: SU Apricot Appeal 4 1/8" X 5 3/8", DCWV the Fall Stack 4" X 5 1/4"
Wonderful variety of DT creations. Like the embossing & arrangement of each & everyone. I used all scraps in my card creation except for the pattern paper. Cloudy & rainy here in Central TX. I love your card Laurie!! The colors are great!! Hi Laurie, Loving your card, the sentiment is just perfect!! LOVE IT!! Every one's cards are great, but do I have the most scraps?? LOL!! Laurie that is very amazing card. Love the sentiment. Great job by the whole team! Cant wait to see the great projects submitted this week!!! Great Card love the shped you used and the embossing. Really great creations by the DT. Have been a bzzz bee using up my scraps.